Enjoy the versatility of winter root vegetables by taking them from side dish to main dish in this seasonal salad bursting with color, flavor, and nutrition! I was compensated for writing the original article and developing the recipe found in the January 2016 issue of Today’s Dietitian. I was not compensated for sharing the column or magazine with readers on my blog. All opinions are my own. Root vegetables are some of my favorites in the vegetable food group and are often served aside my protein of choice for quick and easy weeknight meals. But they can be used for far more than a side dish. I use many of the higher carbohydrate root vegetables to make creamy soups without the addition of cream like my Roasted Butternut Squash Sweet Potato Soup and my Creamy Parsnip Pear Soup – a great way to start a meal or filling enough to be the main course. Velvety smooth mashed sweet potatoes and winter squash make for a nutritious and delicious twist – and the star of the show – in these Sweetpotato Black Bean Quesadillas or when used as a spread in my Kabocha Flatbread with Rosemary Roasted Grapes and Shallots. Roasted root veggies also add fabulous texture and amazing flavor to grain and pasta dishes as proven with my Spiced Quinoa with Roasted Apples & Root Vegetables, Fall Roasted Root Vegetable Pasta with Kale Pesto, and Roasted Butternut Squash & Brussels Sprout Pasta with Lemon-Sage Ricotta. As you can see, there’s a lot you can do with root vegetables, which is exactly why I highlighted them in my January Culinary Corner column of Today’s Dietitian Magazine. As fate would have it, the 2015-2020 Dietary Guidelines came out not long after the January Today’s Dietitian issue was released, and my message is certainly in accordance with the recommendations for the public. The message is not new – it’s one that dietitians like myself have been touting for years, but thankfully the Guidelines have finally caught up. To read my article in full, head on over to Today’s Dietitian and flip to the last page for the Culinary Corner column. Back to this roasted root vegetable salad, arugula is topped with roasted butternut squash, carrots, sweet potatoes, parsnips, beets, Brussels sprouts (not a root veggie, but deserves to be added! ), pomegranate seeds, and toasted pecans and then tossed in a pomegranate ginger dressing for a salad that’s bursting with color, texture, flavor, and nutrition. Enjoy it as a starter to your meal, in a smaller portion as a side dish, or top it with your favorite cheese, beans, chicken, salmon, or tofu for a protein punch. (We had it for dinner just a few weeks ago with poached salmon!) While you’re at it roasting the veggies, go ahead and roast some more to make one of the other recipes mentioned above. Meal planning at it’s finest! Hearty winter root vegetables go from side dish to main dish in this seasonal salad. Pomegranate seeds add a burst of color and flavor, plus nutrition. Top with sliced chicken breast or a sprinkling of goat cheese for some added protein. If using fresh pomegranate arils to make the dressing, pulse them in a small food processor until juiced. Strain juice and discard seeds. In a small bowl or covered jar, combine pomegranate juice with remaining dressing ingredients. Whisk together or shake in closed jar until emulsified. Shake again before using. Preheat oven to roast at 400 degrees F. Line two large baking sheets with aluminum foil or parchment paper. On one prepared baking sheet, toss carrots, parsnips, and Brussels sprouts with 1 tablespoon olive oil. Spread in a single layer. On second prepared baking sheet, butternut squash, sweet potatoes, and beets with remaining tablespoon olive oil. Spread in a single layer. Place both trays in the preheated oven and roast until all vegetables are tender and brown in spots, approximately 15 minutes for the tray with carrots and 20 minutes for the tray with butternut squash. Stir halfway through cooking time for even browning. Remove from oven and set aside until cool enough to handle. 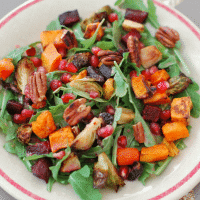 In a large bowl, combine arugula with roasted root vegetables, pomegranate seeds, and toasted pecans. Drizzle about two-thirds of the Pomegranate Ginger Dressing over salad and toss to combine. Store remaining dressing in the refrigerator for another use. Measurements and vegetables used can be modified based on preferences. Dressing recipe makes more than what's used in the actual recipe - use as much or as little as desired. Thanks so much Serena – glad you liked the column and the recipe! I hope you give the salad a try! I love everything about this salad Jessica! The colors, textures, flavors…love, love, love! Thanks so much Sonali. I really think this salad has it all! Everything about this says put me on your Thanksgiving dinner table!!! It’s just so pretty and what a great combo of nutrients too! Thanks Amanda! You’re right – it would be pretty on the Thanksgiving table! I love all the colors too! Oh yes – bring on the fall & winter salads. I love salads for lunch each day to really beef up my veggie intake & root veggies is something I haven’t added much recently. Great idea! Thanks Heather!I often forget to add cooked veggies to my salads also, but they’re so yummy! I hope you enjoy it. You had me at pomegranate!!! This looks so fresh and tasty. Love the ginger in it too. Thanks Julie! I’ve been buying pomegranates left and right – my girls are obsessed with them! 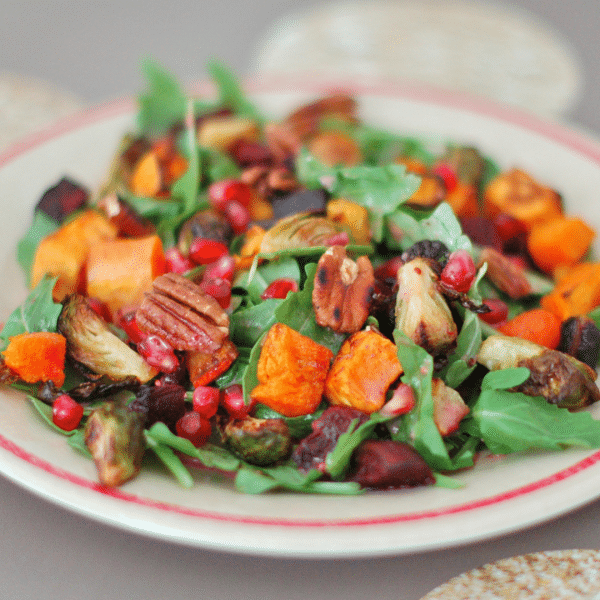 This is a gorgeous fall salad! Would love this for lunch! Thanks so much Taylor! I love making it for lunch when I have roasted veggies on hand! Simply delicious, this is my kind of salad! The Pomegranate ginger dressing sounds so good. I have everything to make this except the parsnips, might have to try to run out and grab some. Roasted root vegetables are the best! I can’t get enough of them this time of year and eating them in salad form is a great idea! And this dressing sounds amazing!! I agree! Can’t get enough. Thanks so much Rebecca! Hope you try it out! I needed some fall salad ideas! And cinnamon in dressing – I’m so intrigued! How perfectly timed then! Wait until you try that dressing – it is so good! There are so many of my favorite ingredients here in one bowl! I can’t wait to try the pomegranate dressing! Thanks Emily! I’m a salad loader – the more ingredients in there the better! This sounds amazing! I love all things pomegranate! I’m anxiously anticipating their arrival at my local costco!!! Thanks Laura! I got 3 pomegranates for $5 at my ShopRite the other day – I was so excited!! My kids love them! This looks delicious! I love sweet potatoes and actualy have never tried a salad with them (I just eat them straight up). I’ll have to give this a try! Thanks Patty! The sweet potatoes are so yummy in salad – that is if you can resist eating them all off the baking sheet! This looks like the perfect Fall salad! Yum! Thanks so much Lindsey! It is quite delish. Hope you give it a try! Thanks so much Anne! I am too – can’t get enough of them! I can’t get enough roasted root veggies! Hope you enjoy Abbey! I love root vegetables. This salad looks perfect. Another great way to use up my butternut squash! I’m so glad you love roasted root veggies too! Enjoy. I love them all year long too! Sweet potatoes are always on my kitchen counter! I need some of these root veggies in my life right now! Looks delicious!! Thanks Carmy. This is one of my favorite salads! I definitely need this lighter option after all of the yummy Thanksgiving foods! This combination sounds so good! Pomegranate ginger dressing sounds so interesting! Ginger always makes magic. It’s so yummy! Let me know if you try it Laura! What recipe are you referring to Gale?